His name was Leroy Johnston and unless you are a scholar of World War I or African-American history, chances are very good that you’ve never heard his remarkable, sad and largely forgotten story. Like most soldiers, he is unknown. Take a walk through a veterans’ cemetery this Memorial Day weekend, pass by row after row of white granite markers that stand erect, as if still on duty, and then read all the names. The countless names. Almost all of them are now forgotten, save to their loved ones, if they are still alive to remember. Whole wars even fade from collective memory, like World War I, Johnston’s war, “the war to save democracy”, as the recruiting posters then proclaimed. Though this worldwide conflagration that America officially entered on April 6th, 1917 took more than 38 million lives, birthed modern warfare and shaped the world we know today, 100 years later it has become, in a way, our unknown war. And so here is one unknown soldier’s story from an unknown war. 1917. Like many African-Americans in the early part of the 20th century, Johnston wanted to find a way up and out of the hard life he lived, as the son of poor sharecroppers, in the brutal and violent Jim Crow south. With the outbreak of the war Johnston, like many of his peers, saw signing up to fight as a way to prove to white America that blacks were just as patriotic and willing to serve their country. The hope was that if black soldiers fought valiantly over there, when they returned “over here”, the United States could not help but take notice and finally grant equal rights and racial justice for all. As W.E. DuBois noted in advocating for black participation in the war, “Let us, while this war lasts, forget our special grievances and close our ranks shoulder to shoulder with our own white fellow citizens and the allied nations that are fighting for democracy." By war’s end, 375,000 African-Americans served. 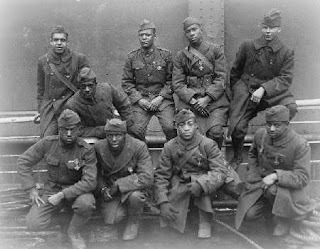 In November 1917 Johnston traveled from the Mississippi delta to New York City and signed up as a recruit for the Harlem Hellfighters, the 115th National Guard Regiment of New York City, an all black unit. 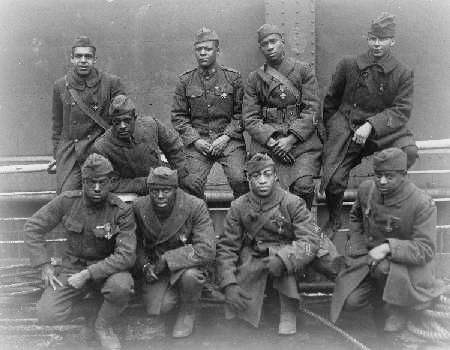 Though President Woodrow Wilson and Supreme Expeditionary General John Pershing were reluctant to empower African-American soldiers, finally in early 1918, the Hellfighters were assigned to France’s Command and went overseas. The 115th were the very first Americans to fight in the war. For the next two years they were among the most decorated of American units, recognized as fierce, tough and tenacious. Of the original 2,000 soldiers who fought, 1,300 were killed or wounded, one of the highest casualty rates of the war. Johnston saw the worst of battle at the Meuse-Argonne, sustaining such serious wounds that he spent nine months in French hospitals. In October 1919, just a few weeks before the final Armistice and end of the war, Johnston was traveling by train to his home in Philips County, Arkansas. He’d returned in July, ready to resume his life. Unbeknownst to him, the county that day was ablaze with race riots, that were breaking out across the South, as returning black soldiers rightfully expected and demanded to be treated with dignity and respect as veterans. And so as Johnston sat on that train with three of his brothers, a mob of whites rushed aboard and dragged out the Johnstons. So this weekend may we remember the unknown soldiers like Leroy Johnston. Remember: the millions of American men and women who respond to the call of their nation to take up arms and defend freedom. Remember: that on the battlefield, the blood that is shed is always red and the cost of war does not discriminate. Remember: that sometimes wars to save democracy are fought overseas and sometimes struggles for liberty happen right in our own backyard. Still happen to this day. Remember. God help us remember and to never forget. When a Public Library Dies, Is Democracy Next? Library patrons also surf the net. If you lack access to high speed internet or just need help with the computer, the library’s often the place to go. The homeless seek warmth and shelter within those walls too. Curious kids carry oversized piles of colorful books and plop down in a sunny corner room for a quiet afternoon. Local authors plug their latest books. Frequent road trippers like me check out books on CD for long car rides. Seniors read the newspaper. Public forums on everything from frogs to fascism to fashion happen within that space too. The public library may be the most democratic of civic institutions left in the United States. At a time when distrust of anything “public” or supported by government funds is at an all time high, it is right and good to remember the miracle of that little brick building tucked away on Main Street or that soaring edifice in the city center or a simple one room edifice on a quiet rural back road. The “public” means that everybody is welcome, EVERYBODY: no exceptions. As common repositories of knowledge and information, art and literature, new magazines and dusty old manuscripts, libraries are secular cathedrals of wisdom, open for all and free for all. Doesn’t matter if you are a high powered genius M.I.T. researcher hunched over mathematical tomes or a squirmy toddler clutching his very first book. That is unless you live in Roseburg, Oregon, a city of 21,903 folks in southwest Oregon, the biggest city in Douglas County. Voters there last fall rejected a measure to add $6 a month on to their tax bills, to keep open the county’s eleven public libraries, including the one in Roseburg. The sign at the front desk of that library says it all. As of June 1st, “All services will cease.” According to a May 13th New York Times article about the demise of that public library, the shuttering is due to fervent anti-tax, anti-government sentiment among county citizens. Twenty four hour law enforcement coverage has ceased in Roseburg too. Jails are severely under funded and non-violent offenders are routinely set free. Elections are at risk too: no one to pay the clerk. The irony is that the county property tax rate is actually sixty percent lower than the statewide average. Yes, the citizens there have the absolute right to de-fund practically everything “public” I suppose. That’s democracy too. Makes me wonder what’s next to go? How about street lights, road repair, ambulance service, firefighting, maybe even public schools? But a place without a public library? I just cannot fathom this truth, and all to save just $96 per year, per citizen. When the “public” is no longer “public”, when cynicism and anger against all things government reaches this kind of fever pitch, we are in very, very big trouble as a people. Not just in Oregon. Every where across the United States. Democracy is only as vibrant and alive as the commitment of the folks who are “the public” in “the public” to be “the public”. That’s you. That’s me. That’s all of us. So instead give me the sign that graces the front desk in the new addition at one of the crown jewels of American public libraries, the Boston Public Library’s central branch downtown. 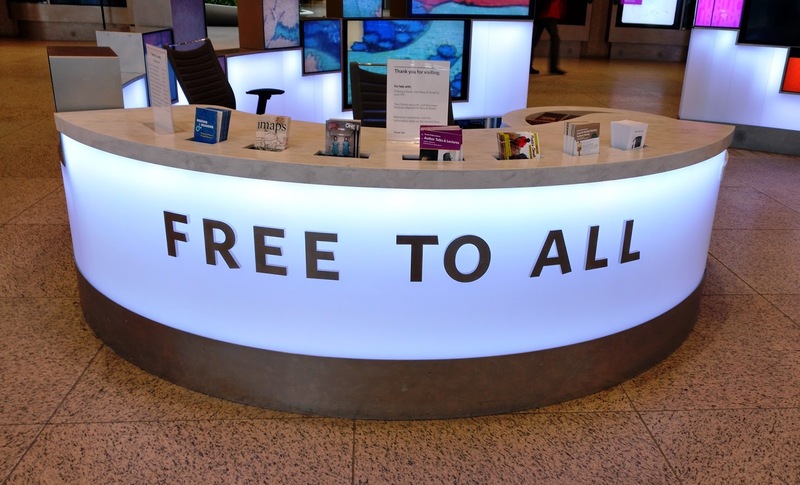 Walk through the Boylston Street doors at the BPL and there, emblazoned for every one to see, is this simple welcome: “Free to All”. Okay, not really “free”. Citizen taxes pay for the library, and companies and corporations too, along with private donations. But finally the public library is free to all, because the public supports the public and then all of us pay our fair share. Together. All in for all, the public. That’s the way it is supposed to work. So maybe I’ll see you at the public library. I’m the one reading the French to English dictionary. Dieu merci pour la bibliothèque publique! Say it ain’t so Sox fans. Last week while the Red Sox were battling the Baltimore Orioles baseball team on the field, things got really ugly off the field, in the stands, on a blustery and chilly Monday night. 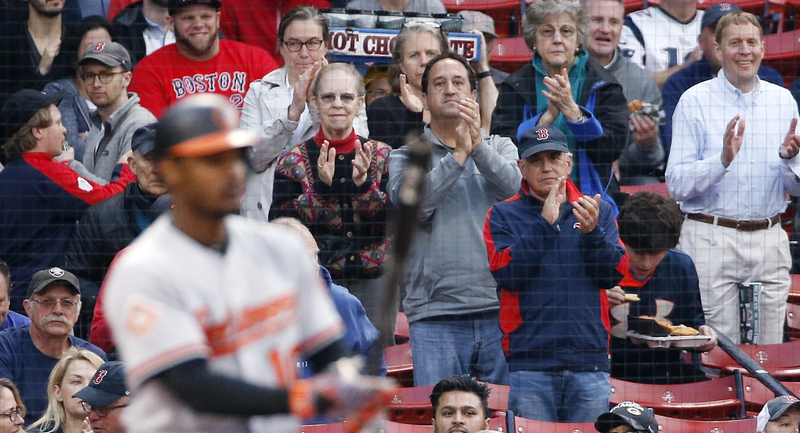 Orioles’ center fielder Adam Jones was the target of racial slurs hurled from the bleachers by lughead Boston fans. To the Sox credit, the team responded quickly and forcefully, decrying the incident and instituting a new fan behavior policy. Future similar racist incidents will now result in immediate ejection and a lifetime ban from the park. Fans even stepped up the next day by giving Jones a standing ovation on his first at bat. End of story? Afraid not. Because that would mean the end of the ancient and stubborn human sins of racism and bias. Now I believe that most humans in society and the world do hope and pray for that great day, when, in the words of the Reverend Doctor Martin Luther King Jr., all will be judged, not by the color of their skin, but by the contents of their character. That’s the good news. That’s the dream of the majority of humankind. Of God, absolutely. But the truth? We’ve got a long, long way to go yet. Especially when we are still unwilling, as a society and individually, to confess to and to own our inherent bias and prejudice, as human beings. The truth that all, ALL OF US, carry within, the seeds of prejudice. Of looking at another and seeing a “them” or “those people” and not a flesh and blood child of God, just like us. Our species seems hard wired for racism, for “–isms” of all kinds. I know I am. My clergy collar does not exempt me from primordial feelings of fear or threat or anger or judgment towards those I perceive to be different than me. Race. Gender. Religion. Sexual orientation. Culture. Class. Politics. What I have come to learn is this: until I face into that truth for me, own that reality, nothing will change in terms of how I live in this world. Let’s be clear. To face this truth is really, really hard. As a lifelong Sox fan, I don’t want to face into the often ugly racial history of our beloved hometown team. The fact the Sox were the absolute last team in major league baseball to integrate, thirteen years after Jackie Robinson broke into the big leagues in 1946 with the Brooklyn Dodgers. The fact that beloved African-American players in Boston through the years, like Jim Rice; they were subject to racism, and not just on the field or from the stands, but in the community too, the local places they chose to live and to raise a family. I get that no one wants to be labeled prejudice. Not me. Not any of us. I get the reluctance and fear to look at ourselves so clearly, so without bias, when it comes to our bias. But here’s my truth: until I can admit to having a problem, the problem itself can’t and won’t change. Until I can confess that I, in fact, at times, actually benefit in this world: because of my skin color and how I choose to worship and who I choose to love; until I lean into this, things won’t change. I won’t change. The world won’t change. I have to face the truth. Hear the truth too. 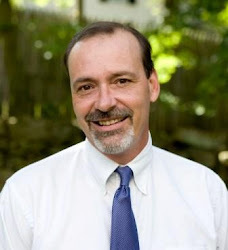 “Want to come to a Red Sox game with me?” Thirty years ago I was a first year divinity student at Boston University, a five minute walk down Commonwealth Avenue to Fenway Park. I offered this innocent invite to an African-American classmate of mine who’d told me she’d never seen a game. I thought about it for a moment. “No.” I confessed, confused and sad at this truth. When it comes to bias, we as a people, a city, a nation and a world: we’ve come a long, long way. But…we’ve still got a long, long way to go. That’s the truth. Just ask Adam Jones. Levi’s blue jeans. 505’s. Mine are thirty four inch waist, thirty two inch length, unwashed, $34 a pair at a local store. Deep indigo blue, the color of a dark winter night’s sky, with multiple wearings and washings, my Levi’s eventually fade as they get broken in. The older, the more worn, the more ragged, the more “real”, all the better. 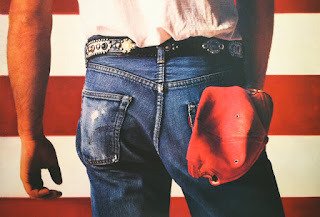 In the American wardrobe there may be nothing quite as “real” as a trusty pair of Levi’s blue jeans. Unlike other clothes that can fade in popularity as they age, get shoved to the back of the closet or dumped into the Goodwill bin, jeans improve with the wear and tear of real life. Get more “real” somehow, even as they break down. Created as work pants in the late 19th century for western workmen by two immigrants-- Latvian tailor Jacob Davis and German fabric supplier Levi Strauss--overalls (they weren’t called jeans until the 1950’s) were and are still made for real life. Copper rivets secure fabric that’s practically indestructible. There’s a handy watch pocket too. Well worn and dusty blue, there may be no more comfortable or utilitarian or real pair of pants on the planet, at least to this Levi’s acolyte. Except for a traumatic middle school episode when, in a fit of household expense cutting, my Mom tried to make me wear Sears Toughskin jeans (HERESY! ), I’ve been a Levi’s guy all my life. Except that if you have to buy fake jeans with fake mud and dirt falsely caked on, you probably haven’t seen “hard-working action” beyond taking an I-Phone out of those pants to pay for a Unicorn Frappucinno at the local Starbucks. To be fair: I’m not a steelworker riveting together a skyscraper or a cow hand riding a bucking horse in my jeans either. The most action my Levi’s see these days is getting mud stained in the garden or worn out from wrangling an ornery office chair. What strikes me most about this weird idea of work jeans, is that it seeks to convey to the world that you are someone, who in fact you are not. How all too human that behavior is. How common. How normative. And at its worst, how sad. To try and be someone we are not: like a pseudo mud stained worker. To imagine, even, that we are not good enough or worthy enough just as we are: real, as God made us, and so instead we don absurdly expensive fake work jeans. We try to become someone else. To be real, to be really real: it is very hard work in this life. To get real. To be the actual person our Creator made us to be. To remember and accept that we are all like a beloved pair of old jeans. We’ve got our rips and tears, our frayed edges and our imperfect seams, our holes and our patches. But that’s what it means to be human. To be authentic. To be loved. And we worked hard for every one of those imperfections too! No counterfeit dirt for us. So when it comes to real life, just give me my funky and fading 505’s every single time. It’s who I am. In a way it’s who we all are too: beautiful, God-made, broken in, and really and truly real.